Two entrances separate the cluster of foot traffic into Dai Due, one at the butcher shop and one at the restaurant front. The cozy dining room, bar and rustic kitchen are filled with a tightly wound system of food and beverage deliveries to an arrangement of tables that sit comfortably close, in a community dining environment. Dai Due employs more than just kitchen staff. They are foragers, talented providers of gastronomic splendor and inventive all the while. In six weeks, I have visited this culinary discovery half a dozen times. I’ve concluded that Dai Due may not be pioneers in their dining style, but they are presenting it in a way that is better. I thought it appropriate to share with you a list of ways you can ensure the best experience possible at Dai Due. In the case of a special occasion, or if you prefer personal space and conversational privacy, I strongly suggest requesting a booth. Although walk-ins are welcome, the organized chaos that occurs in this dainty space looks a bit like a memorable Seinfeld episode, “The Soup Nazi.” There is a gatekeeper, and the world of Dai Due is at the gatekeeper’s fingertips. No reservation, no seats, no food for you! 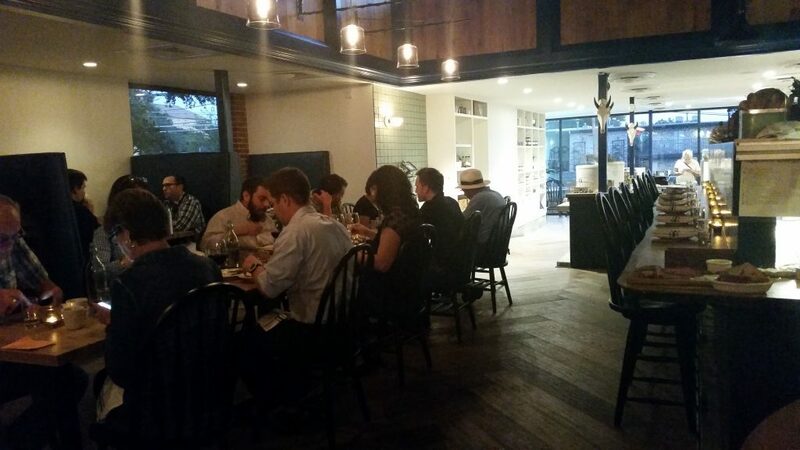 Take the time to make a reservation by calling 512-524-0688 during business hours or booking online. Supper Club Menu is served Tuesday-Sunday from 5-10 PM. The Day Menu is served Tuesday-Friday from 8 AM-3 PM and Saturday-Sunday from 10 AM-3 PM. No reservations are accepted during the day. On one of my visits, I asked a mindless question: where do you get the cuts of meat that fill the refrigerated cases in the butcher shop? The man with the knife kindly responded that entire sections of the animals are sourced from ranching partners, delivered to the shop and hand cut for sale and preparation. Find something you like on the menu, but the dining room is full? You can take home your favorite cut of meat by stopping in during business hours. Tuesday through Sunday, you can choose from traditional cuts, sausage and charcuterie or terrines and pates for a meal at home. As recent additions to the Dai Due lineup, you’ll find traditional Texas selections like tacos and kolaches. More adventurous breakfast diners can try Turtle Gumbo or Dai Due’s namesake breakfast, which includes brown rice with kimchi, fried duck egg and collard greens. Other Day Menu options include sandwiches, vegetable side items and desserts. Like the Supper Club menu, this menu is subject to change. So if you don’t see something you like, wait a week and check again. The Supper Club delivers what I view as dining with a purpose. You’ll be guided by the chef through a meal consisting of a light starter, an entrée featuring a classic cut of beef, chicken, venison, goat, lamb, quail, fish or any one of the grilled dishes they choose to create and a dessert of your choice. Beef Tartare – Crafty play on an American favorite, the cheeseburger. Grassfed beef tartare is accompanied by mustard, pickles, onion and parsley, then topped with egg yolk and served with a cheddar sourdough. Grilled Mushrooms – Sharable portion of smoky mushrooms are plated with bits of charred bacon, parsley, lemon and garlic, a duck egg yolk and toast. Be sure to seek out the small black bits hidden among the mushrooms. They will burst with flavor when you pop them into your mouth. Pork Confit – Crispy with a sweetened char that will deliciously stick itself into the tiny spaces between your teeth. The pork is served with apple, jalapeno, radish, cilantro and pinto in a honey sauce. 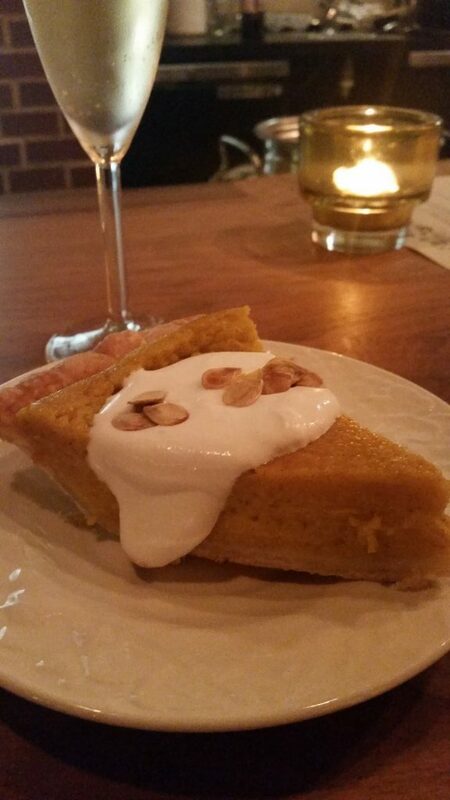 Red Kuri Squash Pie – Close relative to the pumpkin pie, the kuri squash pie provides a fluffy filling and is topped with a delicate whipped topping and pepita seeds. Surrounded with fragrance from the kitchen, I found my sweet spot at the bar. 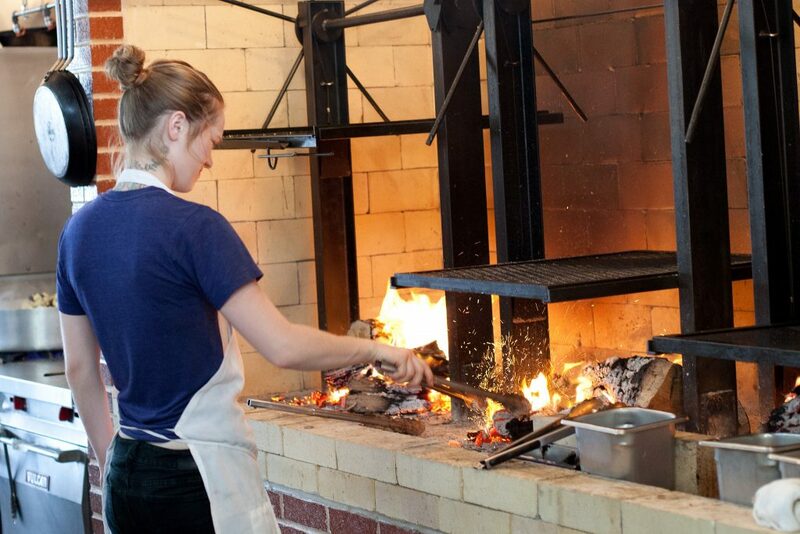 Fully engaged in the flavor profiles leaving the kitchen, I also had a clear view of the butcher shop and dining room, and could see the magic taking place over the wood fire. The bar offers only Texas local beverages. However, you can bring your own bottle of wine and pay a corkage fee. No reservations are taken for bar seating. There is food and fragrance from door to door at Dai Due. Baskets of fresh veggies and loaves of bread line the counter tops, dried herbs adorn the brick near the warm fiery hearth, fresh herbs sit astute in mason jars at the bar top, while pickled items and other jarred foods line the shelves surrounding the dining area. It appears as though you have been invited into someone’s home for Sunday dinner, after a day of food prep has taken place. Enjoy! Sign up for the Dai Due Newsletter, where you will be updated regarding menus, classes, hunting school, special events and more. 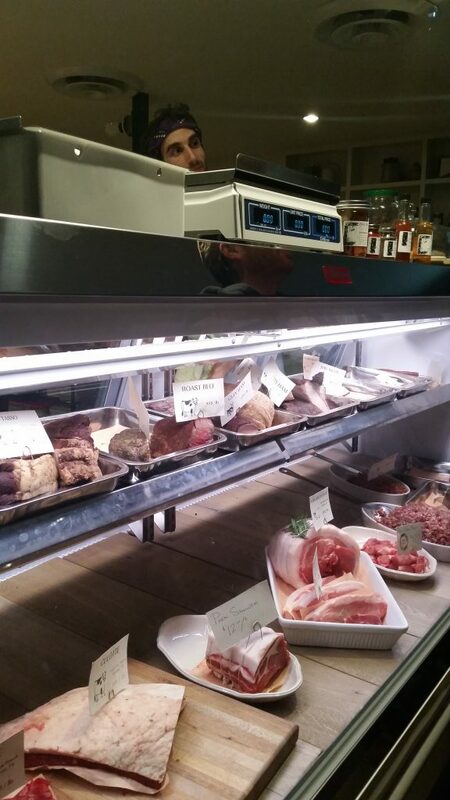 What do you think of the butcher shop/restaurant combination at Dai Due?